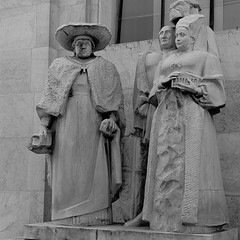 Milan was founded by the Gauls in the early 4th century B.C. and grew rapidly following the Roman conquest in 222 B.C. By 1277, Archbishop Otto Visconti imposed hegemony over the city and 130 years of Visconti rule ensued. 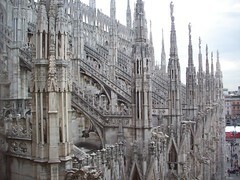 Gian Galeazzo Visconti (1351-1402) was a generous patron of the arts and initiated the construction of the magnificent Gothic Duomo made of white marble with 135 spires www.duomomilano.it. 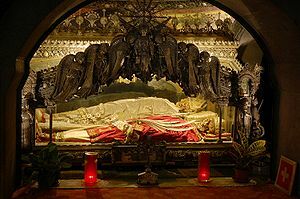 Christianity and you can visit his mortal remains in the crypt of the Basilica of Sant’Ambroglio. He is also the Patron Saint of Bologna. St. Ambrose is one of my favorites because he is the Patron Saint of learning and students., The “Honey-Tongued Doctor” is portrayed with a beehive and bees in his iconography which symbolizes wisdom. He is also the patron saint of candle-makers and bee keepers. The “Fiera di Sant’Ambroglio” is the city’s antique fair and takes place in Piazza Sant’Ambrogio from December 7-22. This event coincides with “The Fiera degli Oh Bej-Oh Bej.” This is a traditional annual outdoor street market held in Milan to honor Saint Ambrose from December 5th to the 8th. For 400 years it was held in front of the Basilica of Sant’Ambrogio, built by Ambrose between 379-386 which is one of the oldest churches in Milan. 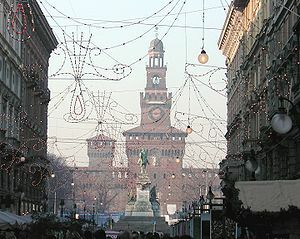 This year the Festival will be held in The Square in front of Castello Sforzesco on Via Dante. Francesco Sforza, husband of Bianca Maria Visconti, became lord of the city in 1450. He ruled from the imposing Castello Sforzesco fortress until 1535. Today, the castle serves as a museum. Francesco Sforza built the present castle where the Visconti castle originally stood. 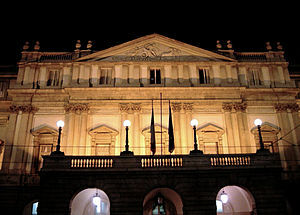 The palace contains several art museums. The Torre del Carmine serves to enclose the fortress of the Visconti family. Michelangelo’s famous “Rondanini Pieta” (1564) can be admired in the Castello Sforzesco. Mangia and have a “Vino con Vista” at the festival where you buy interesting gifts from over 400 stalls and can enjoy a porchetta sandwich, cioccolato con panna montala (hot chocolate) and some “Vino Brule” (mulled wine). Stir wine over medium heat. Add sugar to dissolve. Add remaining ingredients and bring to a boil until sugar is completely dissolved. Salute!! Attend the Epiphany Parade of the Three Kings from the Duomo to the Church of Sant’Eustorgio on January 6th. Milan has an interesting wine bar called La Cantina di Manuela on via Cadore with outdoor tables for people-watching or a nightcap. Try a Rosso della Costa Collina del Milanese or Bianco dell Costa Collina dell Milanese with some Castel Magno cheese. The Lombardy region’s specialty wine is fizzy Franciacorta. Most of the wineries in Lombardy are outside the heavily industrialized city limits in towns located between the Alps and the Apennines including Bergamo, Sondrio, Brescia, Pavia and Mantua.